Although you don’t necessarily need the most costly Mexican auto insurance when you drive across the border, you do need to comply with legal expectations of Mexican officials, including carrying car insurance for Mexico. Your coverage serves as a proof of your ability to cover costs if you are involved in a serious incident that causes damages to another party. Ignoring this need can be disastrous because the individual who completely neglects their need for coverage could end up owing extensive amounts of money, especially if a death occurs from an accident. Legal problems can also be serious for a motorist who fails to comply with the law. How much Mexican auto insurance should I purchase? The cost of car insurance for Mexico costs is computed based on the value of your vehicle, the level of coverage selected, and the time you will spend in the country. 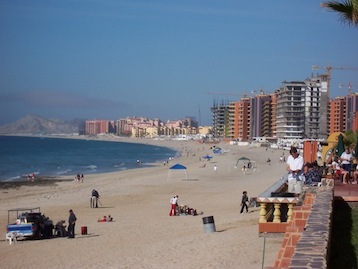 Additionally, your car insurance for Mexico will vary in pricing based on the provider and benefits. Skimping on benefits might keep your costs for coverage down, but you need to remember that the benefits could leave you in a tight financial situation in the event of a wreck. Balance is important. Road trip tip: Mexican auto insurance is required to drive on the toll roads, so pick up car insurance for Mexico! Liability is the minimum requirement when you buy car insurance for Mexico. However, this does not address most personal needs if you are injured or suffer vehicle damage in a wreck. If you are involved in a wreck with an uninsured party, you may have some medical coverage, but comprehensive Mexican auto insurance allows for medical expenses to be covered in various situations. It is important to select liability amounts based on the locations you expect to visit. Some states require high levels of compensation to survivors of a Mexican who dies in an accident, and your policy could be inadequate if you have opted for the lowest limits possible. The selection of a full-coverage policy allows for compensation if your vehicle is stolen, but you must expand such a policy if you want to be covered for the theft of parts or for vandalism. This is a wise investment since these issues are often more common than total theft. Mexican auto insurance from MexicanInsuranceStore.com includes Roadside Assistance at no extra cost for peace of mind! Minimal coverage is good enough when you travel to Mexico for a couple of days. It doesn’t have to be comprehensive coverage as long as you know you’re covered before heading off to Mexico. If you’re on budget, buying Mexican insurance with minimal coverage is already helpful. At least you know for yourself that you’re covered and have a level of protection.